Jack Berry took 4-43 for Bourne against Market Deeping. Bourne eased the pain of their opening day defeat at the hands of Market Deeping by winning the reverse fixture comfortably at the Abbey Lawns today (July 7). 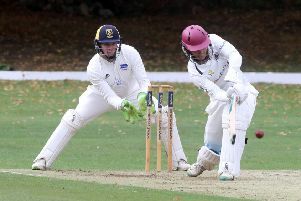 Deeping won that April fixture by four wickets, but Bourne strolled to a six-wicket success today in a game arranged to fit around England’s march into the semi-finals of the World Cup. Sam Evison struck 45 for Bourne against Market Deeping. Deeping won the toss and elected to bat in the blazzing sun, but they were in early trouble against the pace of Colin Cheer (2-22) and never really recovered. They were eventually dismissed for an inadequate 153 with Pat Harrington (35), Dave Gillett (31) and Dave Sargeant (29) contributing best with the bat. Jack Berry (4-43) returned the best bowling figures although slow left armer Tom Dixon (2-37) bowled tidily. Berry was dismissed early on on Bourne’s reply but the talented Evison brothers steadied the ship and set their side on their way to victory with a second wicket stand of 76. Sam Evison top scored with 45 with younger brother Joey Evison, a Notts Academy member, adding 35. For Deeping Sachithra Perera claimed 2-36 from 14 overs and picked up two catches. Bourne moved back into the top half of the table with this win, but Deeping are still too close to the relegation zone for comfort. Market Deeping 153 (P. Harrington 35, D. Gillett 31, D. Sargeant 29, J. Berry 4-43, C. Cheer 2-22, T. Dixon 2-37). Bourne 154-4 (S. Evison 45, J. Evison 35, P. Morgan 30no, S. Perera 2-36).